There’s always a danger working with electrical equipment when a creature of unknown origin is hanging about. Or a dog. Or a hamster. Or a human child. Pretty much anything with teeth can cause trouble. Of course, any of those things would be dead now, but our little friend is more resilient than most other creatures. The post-trauma hair is a common expectation of an experiment gone wrong. It’s also a close approximation of what my hair would look like if I grew it really long and then brushed it out. It’s a nightmare. It’s not something I’d ever plan on doing on purpose. Actually, looking at the comic again, Mike doesn’t have it so bad. 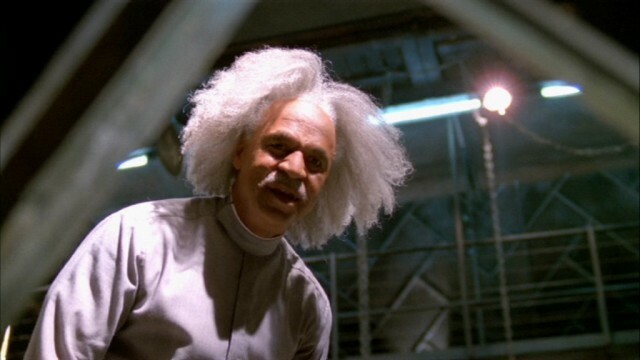 He’s got more of a Doc Brown going on and not so much of a Shepherd Book “too much hair” episode. And he’s the one who is going to want to hide in a smuggler’s compartment until the hair goes away. In fact you’ll see how Mike reacts to this minor disaster on Monday. It’s not going to be fixed as easily as you might think. That moment in firefly was amazing. My hair does a similar thing, hence why I shave it to teach it a lesson. Every moment in Firefly was amazing. That mad scientist look is electrifying! Haha, love those little chew sparks! I know a guy with hair like that. He does it on purpose. If a man has the confidence to pull it off, more power to him.